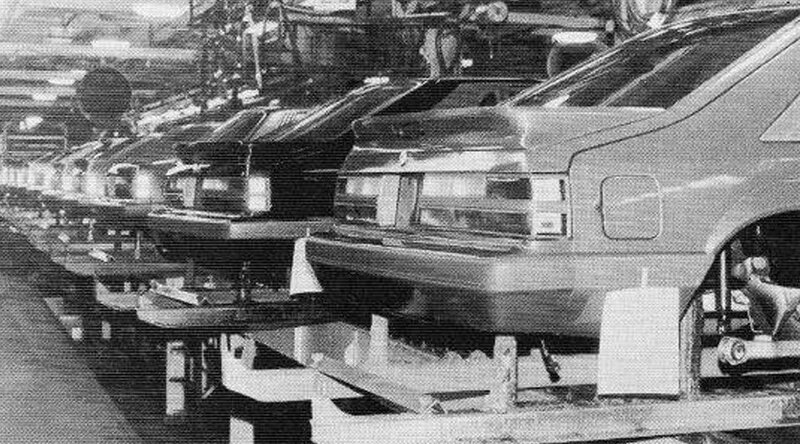 The fox body Mustang story had started in 75/76 with three design teams competing for having their designs slated for production. It was Jack Telnack’s team that had won the privilege of turning their design to reality. Jack had brought the age of aerodynamics to Ford despite being warned against it with this new fox body Mustang. Despite being born into OPEC, high gas prices, fuel rationing and a crises of confidence the 3rd generation Mustang is still considered a very important piece of Mustang history. The early 80’s Fox body Mustang’s factory engine options didn’t inspire too much. From turbo 2.3’s to the under-powered 119HP 4.2L V8 in 80 and 81. Thankfully we saw the return of the 5.0 V8 in 1982 with the “Mustang GT” badge which has been in hiatus for a while. 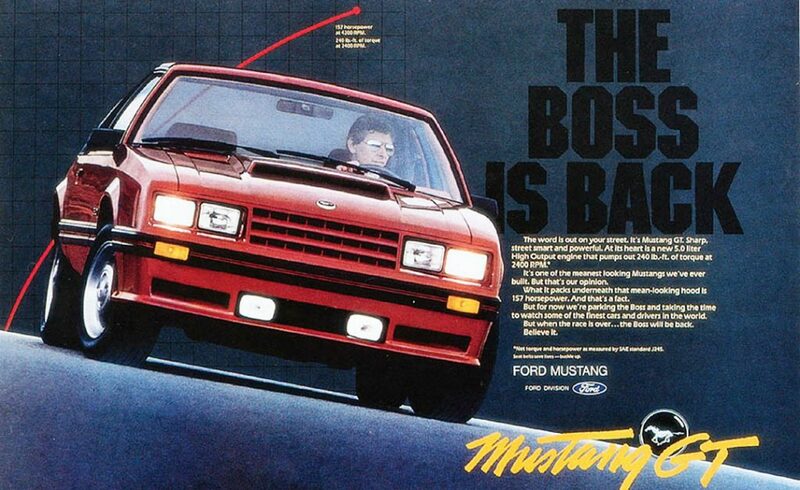 Ford’s marketing team had used the slogan “The Boss is back” with the reintroduction of the GT. While Saleen was only ramping up, Summit Ford dealership had started selling a special edition Mustang called the Dominator GT and had three stages of modifications and a seriously beefed up 5.0L as an option. Then a man named Tom Solomon had created another tuner Mustang with his 1983 Predator G.T. 302 which saw 8 sales in the first year and a substantial increase the following year with 130 units sold. 1984 also saw the birth of the first Saleen Mustang. In the early-mid 80’s we saw things like the Predator GT302R and supercharged Saleens. Back in 1981, Ford created a division that would oversee the company’s racing program and limited-edition street-legal vehicles with technology borrowed from the race vehicles and this was called Special Vehicle Operations, or better known as SVO. 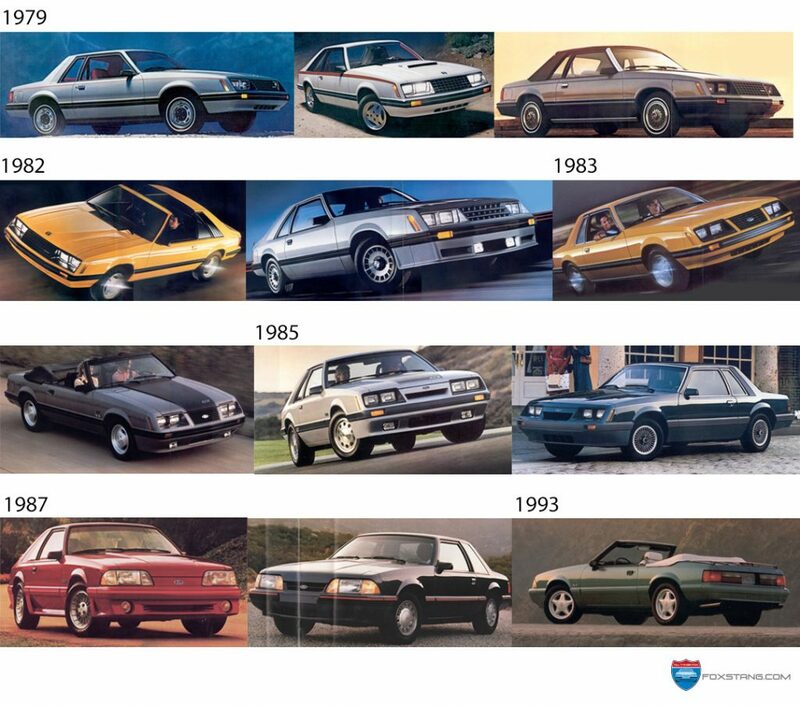 It was this team that created the 1984 SVO Mustang. The SVO fox Mustang was REALLY ahead of it’s time. It had the “aeronose” way before 1987, it had a performance-based turbo engine way before the ecoBoost Mustangs and it was geared for handling which no other Ford Mustang touted. Up in Canada, another tuner Mustang was born in 1985 called DECH, a brainchild of Derek Hanson the Dech Mustang had a unique body kit and the custom built the fox Mustangs as per buyer’s specifications. DECH soon dominated in S.C.C.A. roadcourse events. If you’re interested in learning more about the special edition Mustangs, check out the 3 part series of tuner and factory edition fox Mustangs. The 80’s brought back the horsepower wars, awoken from a large-cubic-inch and low powered V8 engines of the 70’s. They were hyping the turbo 2.3 and Cologne 2.8L V6 so Ford didn’t really speak much about the 5-liter V8 Mustang. At some point someone at Ford said “Hey, we have a Mustang with no performance option!” and asked Jim Clarke (father of the fox Mustang’s 5.0 High Output) to put a revised small block Windsor back into the Mustang. They experimented with a marine cam and a 4 barrel cam for power but ended up using an old Ford Torino cam. The 5.0 HO saw some gradual improvements over the years like a dual-snorkel air filter, 4 barrel carb, Work on the 5.0 had stagnated at around ’87 though. The 80’s saw some interesting cars like the Grand National’s 245HP turbo six but the Mustang had been killing its arch-enemy the F-body Camaros and Firebirds through most of the 80’s and 90’s despite a less advanced chassis and suspension, Ford’s lightweight fox body Mustang with the healthy 5.0 HO was really “the car to beat”. Hydraulic flat tappet .050″ Duration-204/214; Cam Lift-.280/.295; Lobe Center-107/117. Revised block (122 lb.) with two retainer bosses for roller tappets. Power Rating Differences: The 5.0’s rated output of 225 HP for 1987-1992 was a NET rating. And in 1993 Ford reduced it to 205 HP mostly in a way that suggested the 225 hp figure had potentially been a little optimistic. This was more of a SAE standards thing than the 93 model years getting less power. The Fox Body had a 15 year run and although Ford had some subtle changes over the years, most people divide the fox Mustang into two design categories. The “4 eye” Mustang runs from 79 to 86, they call it the 4 eye’d Mustang because of the four sealed beam headlights. The 2nd is referred to as the “aeronose” due to the 6 piece aerodynamic headlight design. 1979 to 1981 featured the same egg-crate grill and introduced a whole new aerodynamic design to the Mustang brand – a clear deviation from the heavier Mustang II. 1982 saw a change in design with the new Mustang GT, featuring more aggressive front and rear spoilers and borrowing the slat grill from the 79 Pace Car as well as a new forward facing hood scoop. In 1983 we saw the return of the convertible. The running horse hood emblem was replaced with the Ford oval logo. The 83 model year started with the taillights that wrapped closer to the license plate and a rounder more sleek nose. The 1985 model year featured a cleaner nose design, borrowed from the SVO with the simple clean single slot below the blue oval logo. Not to mention the beginning of the classic stainless dual exhaust tips on the LX models! 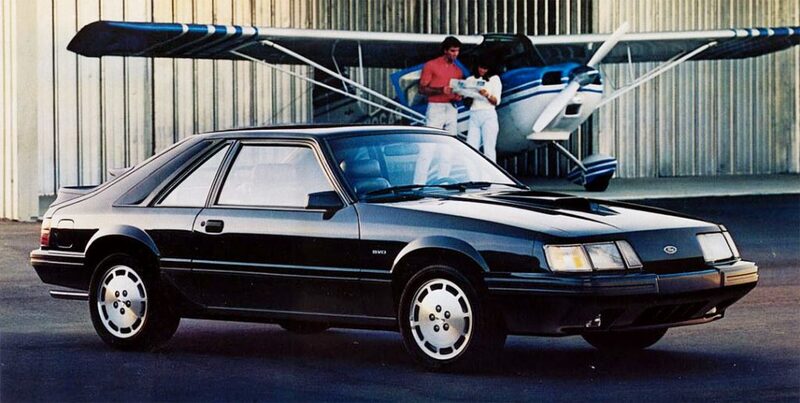 The 1987 model year debuted the “aeronose” look for the fox body Mustang. The LX had a simple slot design with a small Ford oval logo. The GT versions had sculpted rocker panel skirts, “cheese-grater” taillights and a grill-delete up front. The 87 also had an entirely new interior, replacing the 70’s era dash with a then-modern plastic dash with an attached instrument cluster bezel. The same design ran from 87 to 93 although in 92, the LX received body-color mouldings and in 91 the fox body Mustang got larger front fender wheel openings to accommodate the new 16″ pony wheels. Some say the 79-93 3rd gen Mustang really inspired the aftermarket performance parts industry. Being a lightweight, rear-wheel drive V8 powered “compact” car, the fox body Mustang was celebrated by many drag racers and street racers alike. Especially coming out of the oil embargo choked big blocks of the 70’s the fox Mustang was really a whole new lease on life in the performance world. Bringing back a small taste of that 60’s performance we all loved with factory low to mid 14 second quarter mile times out of the box (some got their stock no-option notchbacks into the high 13’s). Being a favourite by weekend warriors, the fox Mustang became the staple car of the performance industry. Which is why, 24 years later, the fox body is still a favourite for racing enthusiasts, even drift and in some cases road course. Today, more than ever, you can practically buy anything for your 79-93 Mustang thanks to its popularity and success. It wasn’t always a pretty picture, we came very close to losing the Mustang brand when it almost became a front-wheel drive Mazda! If you think the Mustang II was bad!? Back in 85/86 Ford had some sort of brain damaging stroke and thought it would be a great idea to fix the slumping Mustang sales by replacing it with a FWD chassis jointly developed with Mazda. By 87 Ford had started to test the Probestang around Dearborn and the word got out about trashing the RWD Mustang for this FWD Mustang abomination. Thankfully the Mustang enthusiast community was very vocal about their outrage and pelted Ford with hundreds of thousands of letters exclaiming they wouldn’t stand a FWD Ford Mustang! Ford swallowed their pride and changed their strategy and the Ford Probe was born and planned to debut in 1989. The executives, still thinking the sporty FWD car will outsell the Mustang and pinned the Fox Mustang and the Probe to compete in showrooms and the results must have deflated their egos a bit. With the Mustang outselling the Probe by large margins. Thankfully that crises was averted and the Fox body continued to live strong to 1993 including some special edition SVT Cobras and Cobra R’s produced. Even today in 2017, the Mustang brand is as powerful as ever and still a RWD platform. The 4th Generation, What Came Next? After 15 years, the fox platform was retired and replaced with the SN95 which had a lot of things in common with the fox body platform. 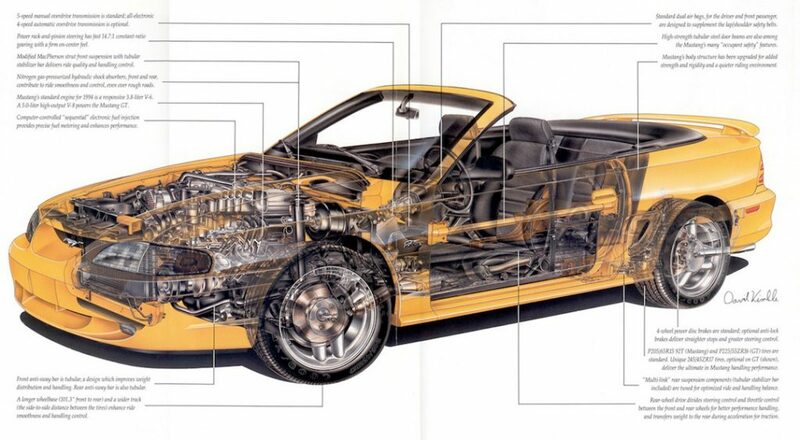 You could say the SN95 is a modified version of the fox as they both basically even shared the same floor pans. Engineers had to put a lot of effort into the structural redesign to increase strength, compared the fox body’s notchback the SN95 was 56% stiffer without adding too much additional weight. The pushrod 5.0HO’s last year in a Mustang was 1995. Junkyard SN95’s have been providing us fox Mustang enthusiasts with brake upgrades since you can literally bolt in the 94-95 spindles and 5 lug axles. There are a lot of restomod fox bodies with modular 4.6L V8’s, hydroboost brakes and full SN95 interiors. With those SN95 spindles, you can even bolt in New Edge Cobra Brake upgrades. Today, the newest fox body Mustang is 24 years old! And they spark fond memories of the 80’s for most people hitting their 40’s and that’s part of the reason why they’re going up in value as a lot of people are starting to look for extremely clean, factory original fox Mustangs for sale. And the problem with that is, despite the fox Mustangs popularity and production numbers, not many are left in clean factory condition so their values have been on the upswing. The fox body is still popular among the weekend drag racer as it really is one of the last lightweight RWD V8’s out there with a huge aftermarket support and a large community of helpful enthusiasts. Have a YouTube search on the stock Coyote class, where they swap in modern 5.0’s and fly halfway down the track with the front wheels in the air. In conclusion, these 80’s boxy Mustangs embodies what a true Mustang is, the fox body has pure Mustang DNA and will always have a place in the Mustang heritage. Find yours if you don’t already have one and enjoy the living crap out of it! If you liked this article, please share with your friends and local fox mustang enthusiasts groups. 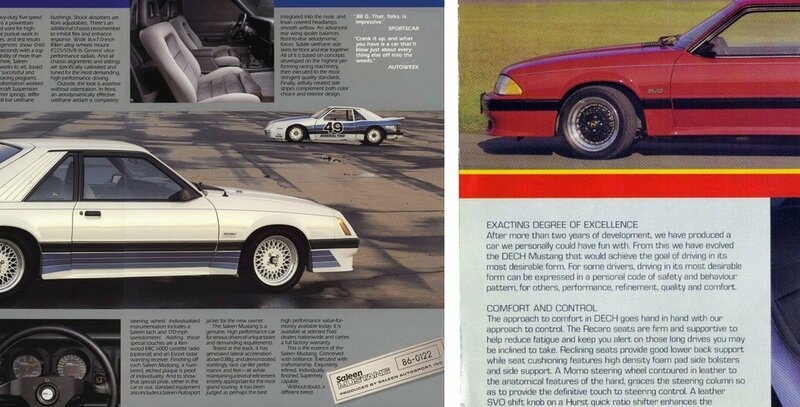 Next up, learn about the fox Mustang special editions we got from 79 to 93. Next articleGreyt Fox Notchback – Certainly is a notch above the rest! I got a 86 GT i bought in high school in the 90’s. It sits in my garage waiting on restoration. Thanks for this great article. I have a 1986 Fox 5.0 5 speed all original except for wheels. I bought it January of 2002 from the original owner a 64 year old man. He said that he special ordered this car on the title it states that it is a LX/GT. On the trim behind the driver door it has GT on the passenger side it doesn’t have the GT and nether side has been removed or replaced. thank you for that great article i bought a 1989 25th anniversary convertible about 18 yrs. ago an i had a complete rotisserie resto done to the entire car i finally got the car back from the shop in ohio about 3 yrs. ago and i wanted to have it done for the 50th anniversary of the mustang event at the carlisle ford nationals but didn’t get it done so i will say after 2 yrs. at the nationals i finally took 1st place in the lx class which was great! Great article!! Good to see the Predator/Cobra get some ink support. The Fox body is starting to get the credit it deserves. How about a full blown article on the 83 to 86 Predator/Cobra? No one knows about these cars.. The Fox Body community needs Jays Garage to do a tv show on the Fox Mustang…Come on Jay! 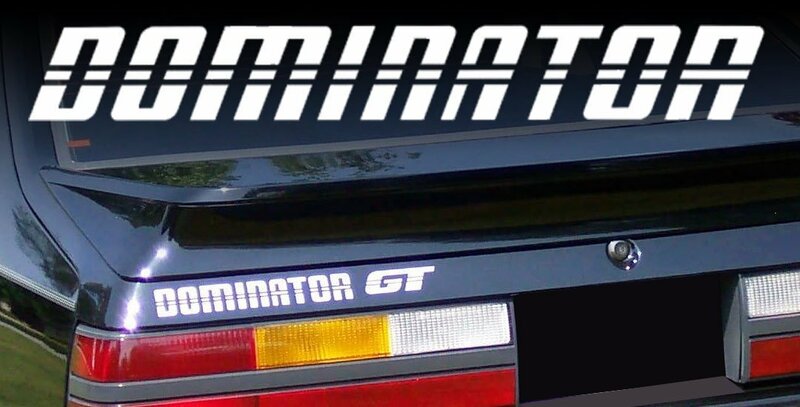 You completely missed the Summit Ford Dominators. They started it all in 1982 before the rest of them an were all about being the fastest Mustangs out there! Thank you for your suggestion. I updated the article since I got a lot of emails about not mentioning the SVO as well.